Physical therapy (also known as physiotherapy) is a primary health care profession that can be found in hospital settings and private clinics, dealing with a variety of musculoskeletal, neurological and cardio-respiratory conditions. 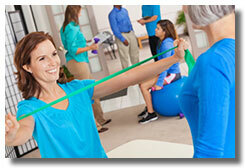 Physiotherapists are highly-educated experts in physical function, movement and mobility. We have advanced knowledge of how the human body moves and what can stop it from moving, and use specialized hands-on treatment to restore, maintain and maximize optimal function and quality of life. In order to improve your mobility, function and well being, physiotherapists use a combination of electro-therapeutic modalities such as ultrasound or TENS for example, along with therapeutic exercises, and hands-on techniques referred to as manual therapy (deep soft tissue techniques, hands-on joint and muscle range of motion and stretching) or manipulation (a quick small thrust to a "stuck joint" to restore mobility). We may also incorporate some non-traditional therapies such as acupuncture. At TAWA Physical Therapy, we assess, diagnose and treat a broad range of musculoskeletal conditions that can affect our joints, soft tissues and nerves. When physical problems arise, you can count on us to help you regain control of your body and normal life. Your therapist will collaborate with your referring doctor or specialist, but you do not necessarily need a doctor's referral unless requested by your insurance company. Contact our clinic to find out more about how you can see a physical therapist today. Our physiotherapists are trained in many specific manual therapy techniques. Some techniques involve mobilizing stiff joints to restore mobility, other techniques focus on improving the flexibility of the muscles. We also do localized specific massage techniques to muscle trigger points. Physiotherapists are the specialists in exercise prescription. At Tawa Physical Therapy & Sports Injury Clinic we will direct you and coach you through the best exercises to perform for your specific injury. Proper technique is very important as is avoiding specific exercises or activities that could potentially aggravate your condition. Knowledge is power. One of the most important elements of injury recovery is knowing about your injury. Our therapists will educate you on the anatomy/pathology of your injury as well as give you a reasonable outcome expectation. We give you specific advice on home management of your injury as well as postural and ergonomic suggestions that will help you in your recovery. Come back soon to navigate our injury explorer tool!